This bowl was made by Bruce Quigley. 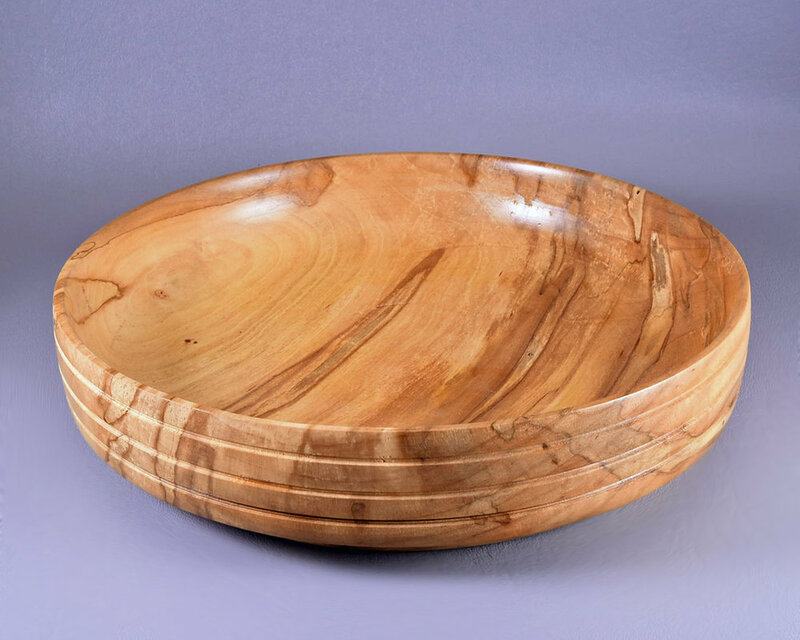 After taking Ed Youst's class on turning and then being inspired by an article in the AAW American Woodturner magazine by Janet Collins (April 2017) Bruce made this fantastic cherry bowl with shaded maple inlays. 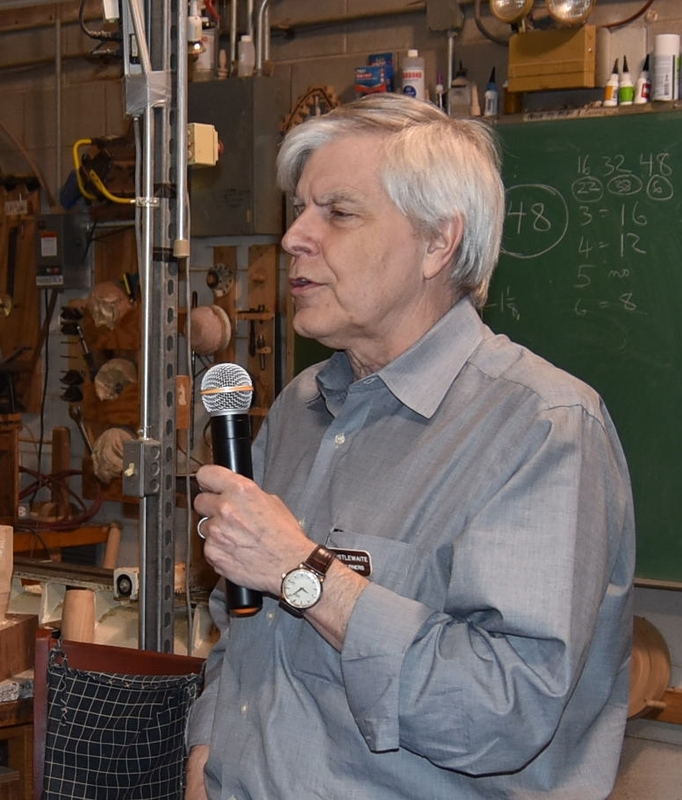 Bruce brought in two other pieces: a Maple bowl decorated with straight inlays of Purple Heart and Walnut, along with a Box Elder vessel made from a piece he got from Bud Hohlfeld. Bob Collins brought in two bowls. The first had a little problem everyone has run into, if you've turned enough bowls: He turned through the bottom on his last pass. No worries for Bob- he'll plug it and bring it in for the next Show and Tell. It's just wood, and it does grow on trees! His second piece was Cherry and it was a beauty! Kathy and Bill Davis showed off some of their recent work. 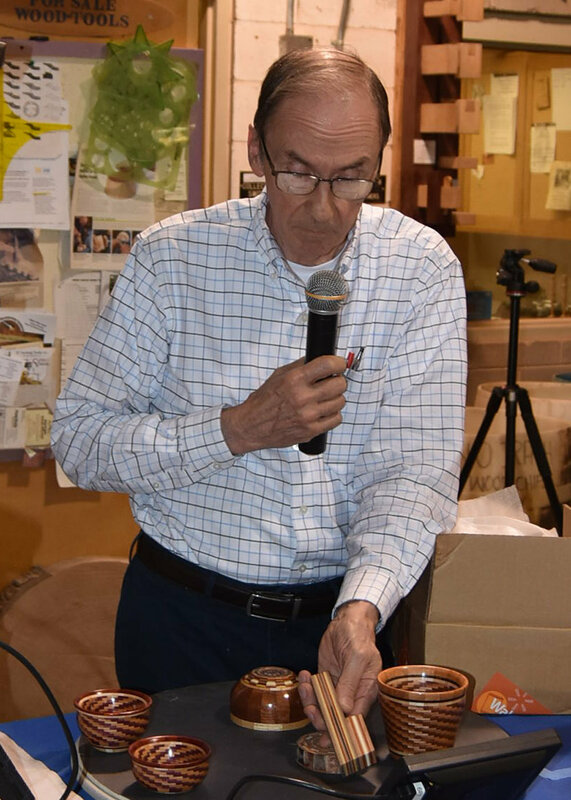 With Bill presenting, first up was Kathy's cedar bowl, followed by two more well-turned bowls that Bill made. A very nice exploration of shape and grain orientation! And from the way they talk, you can tell this team is having a great time turning. Speaking of shape, Andy DiPietro continues to explore form with his sculptural work. This piece is quite an undertaking- a large Pin Oak end grain carving with a natural edge that shows off the marbled grain of the wood. An impressive piece for sure. You can see where Andy is exhibiting his work by following the links on our Facebook page. Andy will be at the Popcorn Gallery though October 22, 2017. We should all be as prolific as Ron Durr! First up was a hollow vessel that ultimately became a teapot, thanks to a suggest by his wife, Lori. Ron tells us that whenever he's stuck, Lori's got the gift to see what the piece should be. Another great partnership in turning. 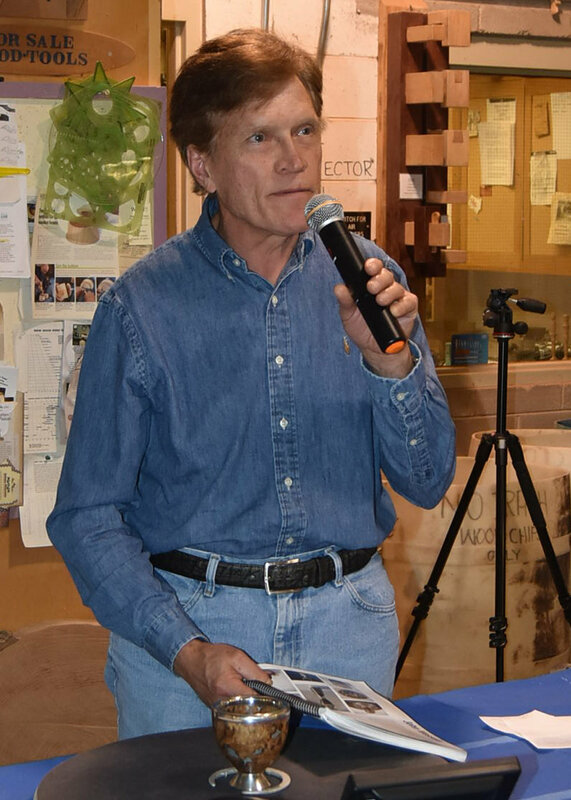 You might remember Dennis Fuge's pewter demonstration last February. This month, he provided an update to his pewter work with this elegant chalice. 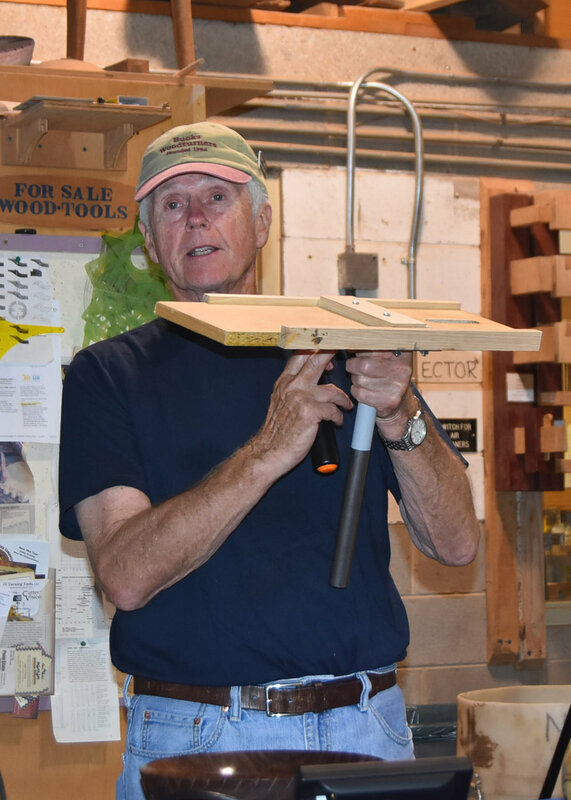 After seeing a demonstration by John Wessels, Dennis has been working with Roofing Solder and Wood's alloy. Note the solder inlay on this burl vessel. Tom Gall finally picked up that bowl blank that has been lying around in his shop for the past 15 years. 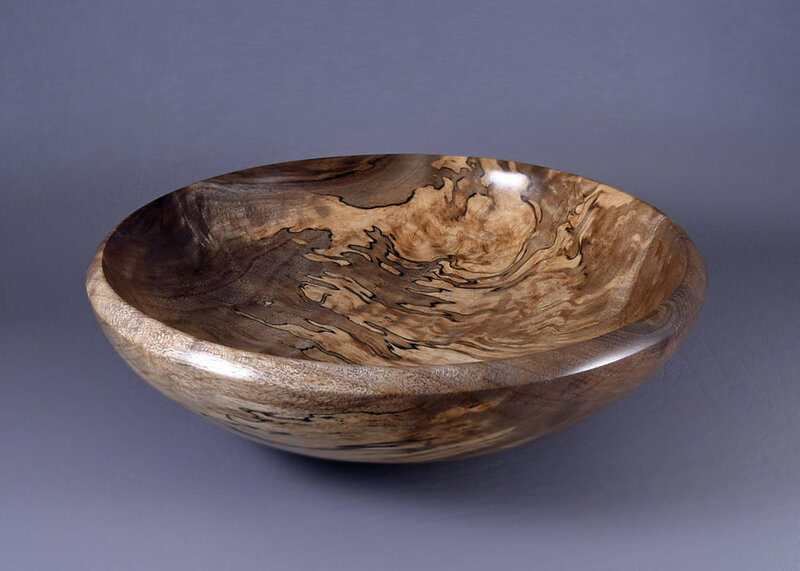 It wasn't any ordinary bowl blank, this one was made by Palmer Sharpless, a founding member and AAW Honorary Lifetime Member. Tom brought in another bowl from a Sharpless blank, one he turned in 1993! 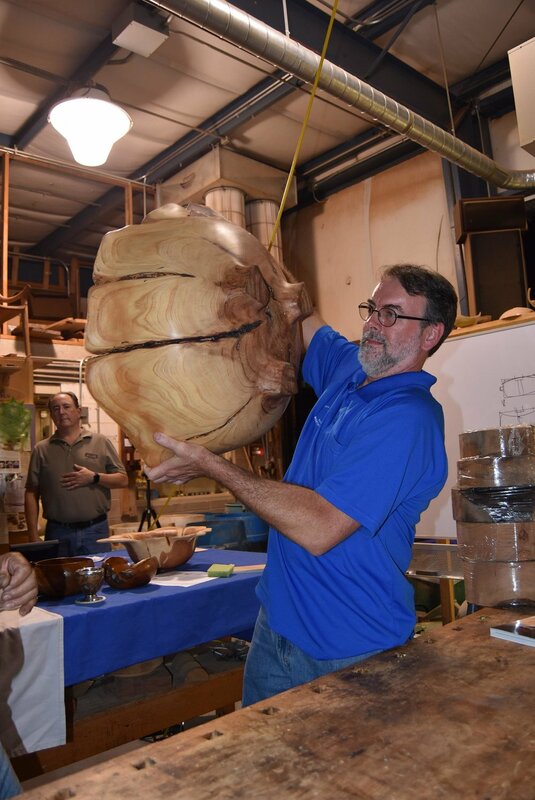 Phil Hauser salvaged this "junk wood" (he thinks, Maple) crotch to make a beautiful sphere. It was a challenge given the tear-out and fragility of the wood. After soaking, treating, and microwaving, he did it! Phil also brought in a piece of Desert Ironwood he picked up on a trip to Tuscon, AZ. He's filled some of the voids with pigmented acrylic resin. Inspired by Dale Larson's tales of harvesting trees, Steve Hillerman tackled a Sandy-downed Ash. Its heavy spalting made for a very impressive piece. Steve also brought in two other ash bowls and commented on the need for using sharp tools on this hard wood to avoid a wavy surface. He has been finishing his bowls with tong and citrus oil. He completes his finish with the Beall buffing system. Check out the crotch pattern in this English Walnut platter Bud Hohlfeld brought in. He's finished it with a coat of Waterlox. Mike Kehs showed us this recently completed teapot, Tea Fit for a King. It was his entry for the National Teapot Show X, at the Cedar Creek Gallery in North Carolina. It is for sale; you can contact Mike through his website- Michael Kehs Woodworks. 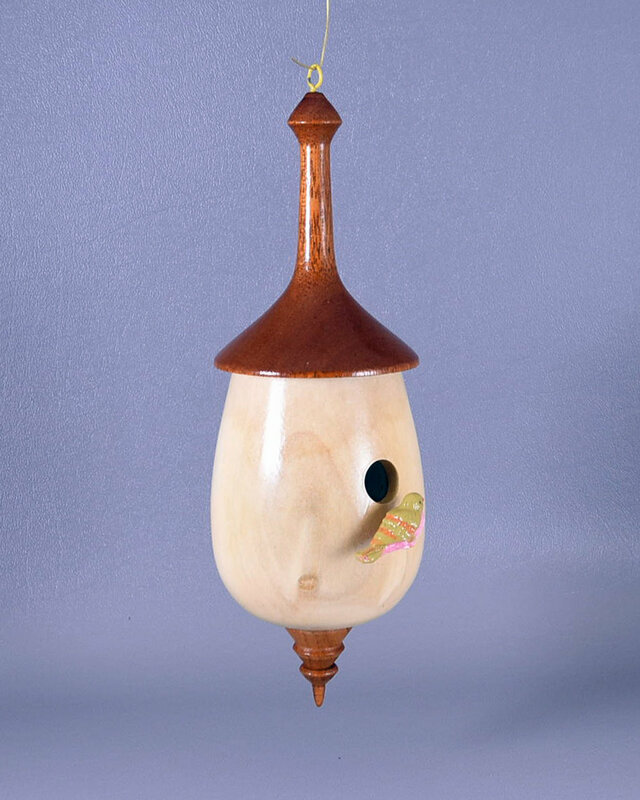 The pot is made from Maple, Ebony, and Cherry, while the butterflies are made from Birdseye Maple and Holly. An amazing piece! Ryan Lazaar has been busy! 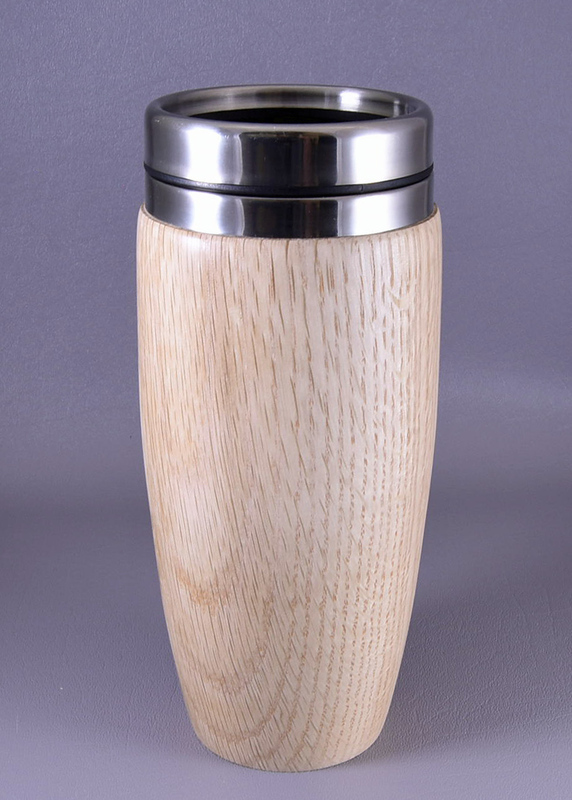 With some instruction from Dennis Fuge, Ryan has made a travel mug from oak, a maple natural edge bowl, a vessel with an aluminum base he cast from soda cans, and pill holders from Purple Heart, Oak, and Maple. Quite a display of technical achievement! 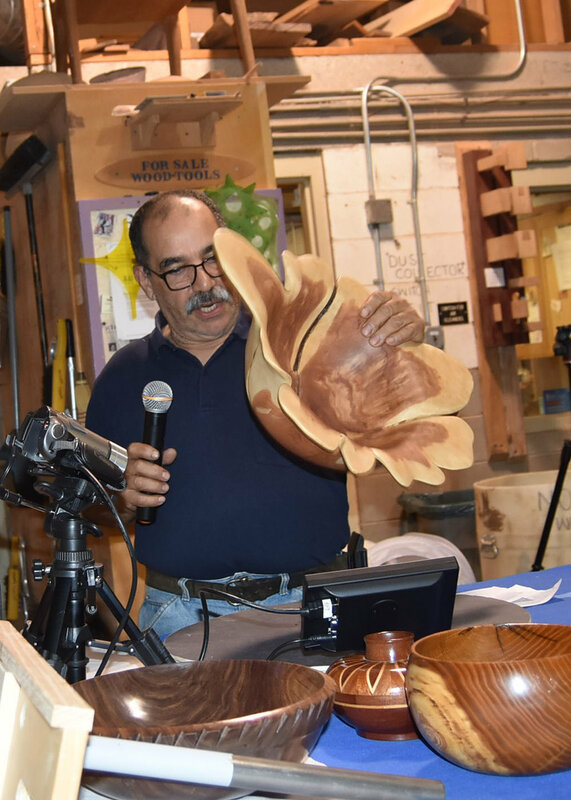 Gil Malave impressed everyone with the two bowls he brought along. Gil intends to put a glass top on the Cypress bowl he's turned and carved to make a coffee table. Just imagine the work that's gone into this- turning something this big is a gargantuan task. (While no problem for Nate Favors, the rest of us mere mortals would really struggle.) Add to that the carving and shaping inside and out! And he brought along another turned and carved Cedar bowl. Nicely done, Gil! 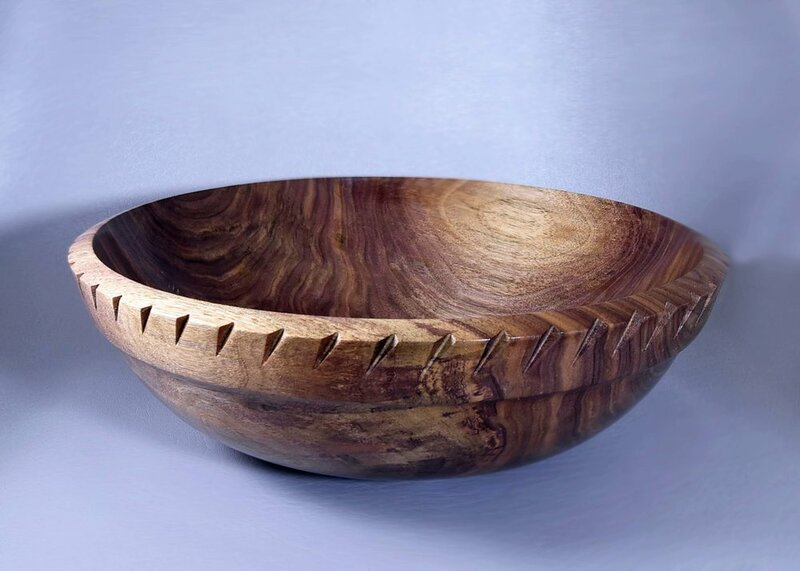 Scott Malin initially had his hands full trying to turn this Black Locust bowl. Wet, it was like turning spaghetti, so he put it aside. It is well know to be hard to turn wet, and, when dry, it is just plain hard. But Scott did it and it looks great with those Locust Borer trails! It is finished with Watco, Danish Oil, and wax. Our master of segmented turning, John Manura, brought a bevy of segmented vessels- some with as many as a thousand pieces. John is able to readily produce this thin stock with his patented Accu-Slice. John has posted a bunch of videos that show just how he does it. They are definitely worth the watch. True to form, Nate Favors brought along two humongous bowls, a natural edge Cherry bowl his sons took down and an oak burl he brought back from North Carolina...on a house hunting trip. Yep, that's the bad news. Nate is relocating to the warmer climates and gallery-rich environs of Bakersville, North Carolina. It sure looks nice there, but we are going to miss him! Dave Nowicki also got involved with a large tree, a 100 foot tall, 5 feet diameter Walnut tree. 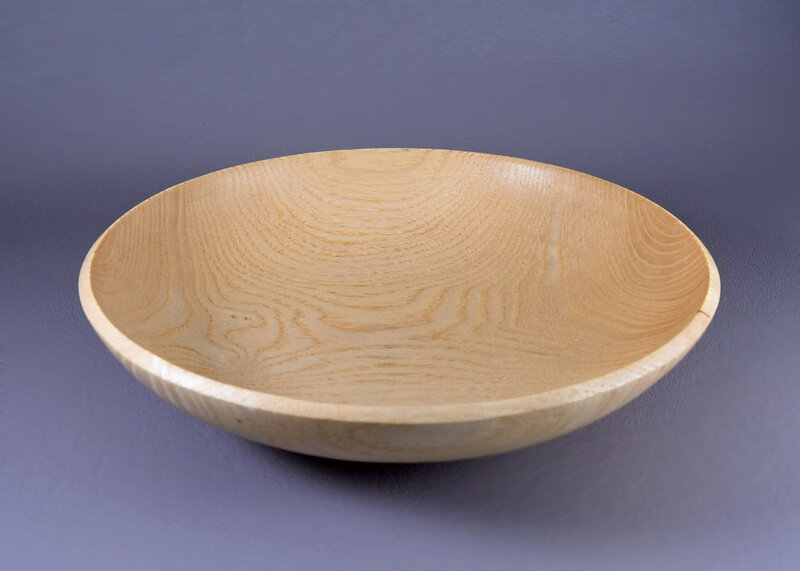 Here's one of the bowls he's made from it; handsomely crafted with a beautifully textured rim. That's one nice looking bowl. 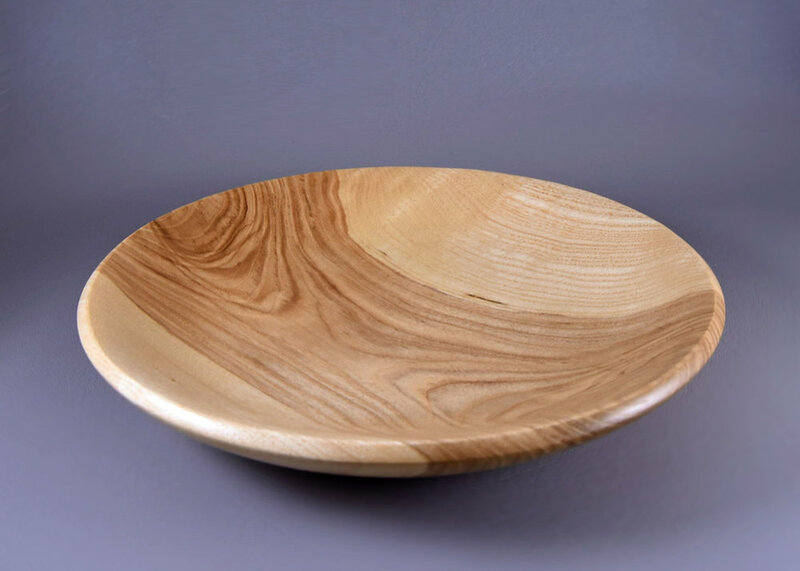 Andy Postlewaite took advantage of the contrasting sap and heart wood of this Ash bowl. 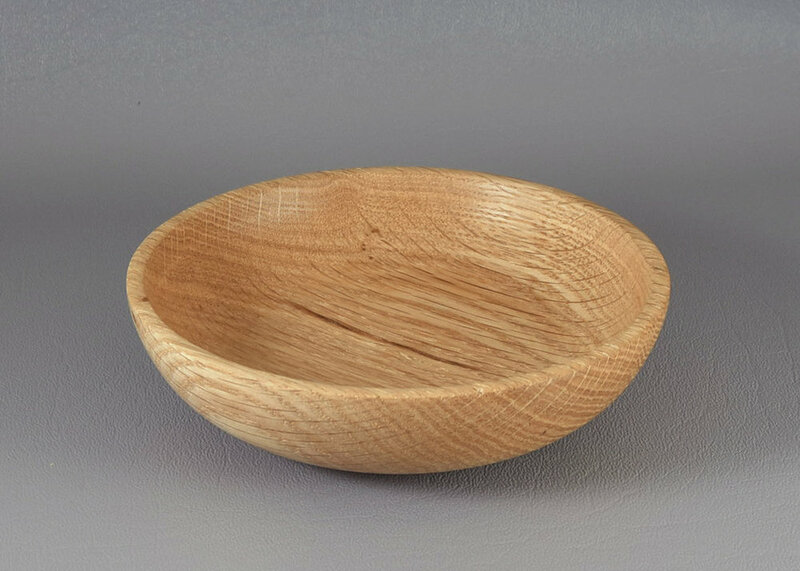 He also brought along a yew bowl that had inclusions and a natural edge; a challenge for any turner. Andy was definitely up to the task and got a great result. Armed with a 1920's Walker Turner lathe and a few classes from Ed Youst, Joe Scherrer completed his first turning. This cherry bowl is finished with beeswax and will be a gift for his daughter. Don't you wish your first bowl looked as good? David Schied used the Wedgie Sled to cut the segments of this Cherry, Purple Heart, and Walnut vessel. Also new to turning, David is proof of how quickly you can progress in turning with a little practice. 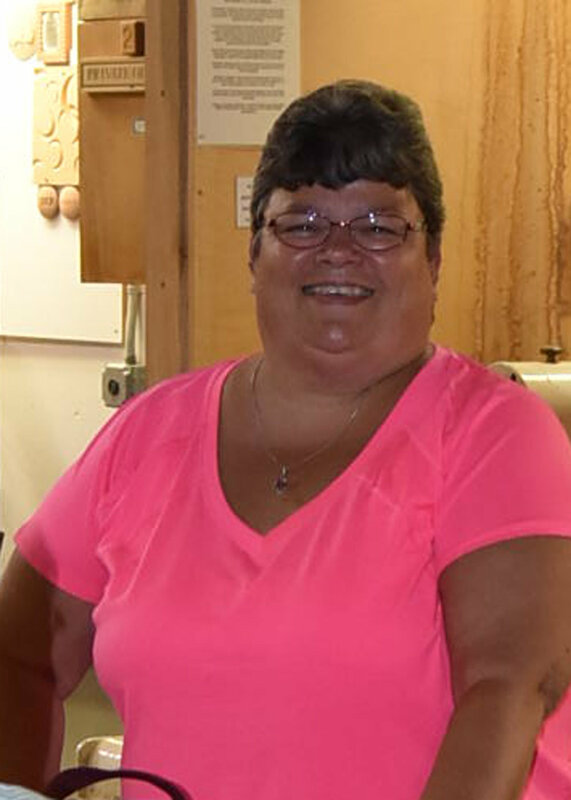 Drewe Schoenholtz is looking to get back into turning. He heard about the club and brought along his first turning from many years back. Drewe is already ahead of the game! Linford Sine tackled this piece of walnut, in spite of a blind knot and extensive spalting, and made a very striking bowl. Using a wire brush in line with the grain, he took advantage of some punky grain and made a very impressive rim. Joe Swope showed the most minimalist bowl of the night. It was an elegantly thin natural edge cherry stained bowl with a nicely centered pool pattern, inspired by Rudy Lopez. That's a lot of air turning! Joe also brought in a "mushroom vessel," a nice accomplishment for a technically challenging piece! Thanks again to everyone who made the night such a success. 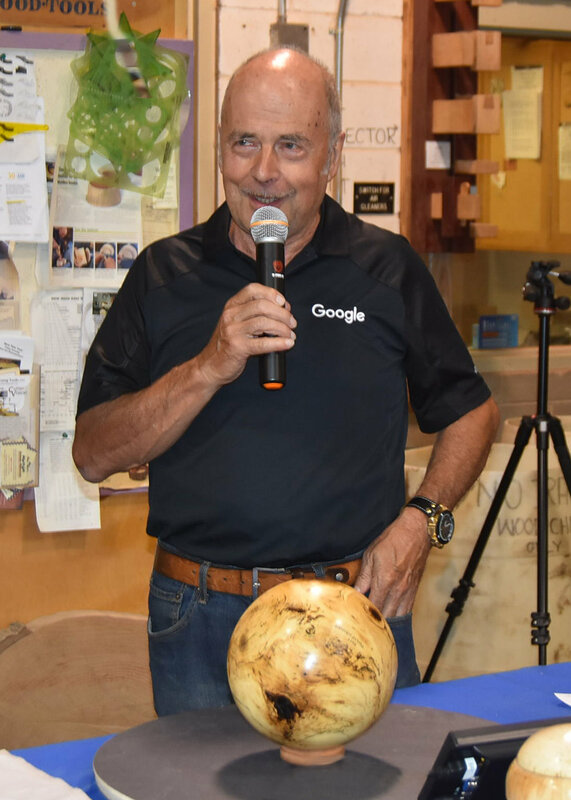 Special thanks to Rick Baker for the video management and to Steve Hillerman for running the Show and Tell.